Sashlocks are a fantastic modern choice for protecting your family home; thanks to the inclusion of a latch as well as mortice deadlocks, these locks are morticed into the edge of the door and offer super durability and function, much like the deadlocks counterpart. We have a diverse range of sashlocks for entrance doors, as well as a collection of entrance door ironmongery and more specialised components like our centre door knobs for more unorthodox door setups. 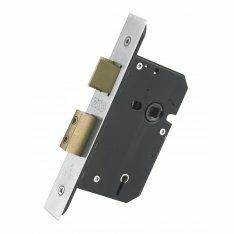 We also provide for more contemporary needs with our varied selection of nightlatches – these easily installed locks sit on the frame and are simple to use and change, if need be. For conservatory doors, garden sheds and other low maintenance doors, our mortice bolts provide ample security without the bells and whistles. And if you need an elegant adornment for your front door, see our decorative selection of door knockers. For doors without handles or doorknobs, you want sturdy cylinder pulls to provide a bit of leverage and frame the lock, and what front door is complete without a prime choice of letter plates, security hoods or letter tidies? We offer a large range of accessories and other components, as well; if you want to add a little identity to your front door, we have numerals & letters in many various fonts and metal finishes, or if you want that added layer of security, our door viewers are a subtle and effective solution. Finally, we stock a stylish catalogue of bell pushes to suit your tastes, as well as several variations of door chains for entrance doors – compact yet durable, these provide a safety net beyond the initial lock, and are a worthy investment for home use.